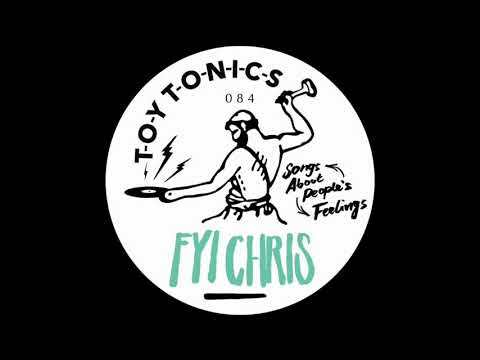 South London based music heads Chris and Chris, AKA FYI Chris are back with a release on Toy Tonics. FYI Chris were cemented into the forefront of the Peckham music scene following a release on Rhythm Section and their work at local record store Rye Wax. The talented duo manages the record store giving them an opportunity to share their eclectic music taste with everyone that visits. It’s one of those shops where you pick up a record and they suggest another. Before you know it you have a bag full sounds you had never heard before, but are not sure how you could have possibly lived without. Today we premiere the third track of the EP titled Flat Psych.The track is driven by the rhythmic pattern of the cymbals, ticking hi-hats and swinging percussion. A vocal harmony that has been chopped and sliced brings the feel good vibes. In a mix this one is perfect when you want to refresh a dance floor add some percussion and bring some positive energy. Be sure to grab your copy, out 7th december.